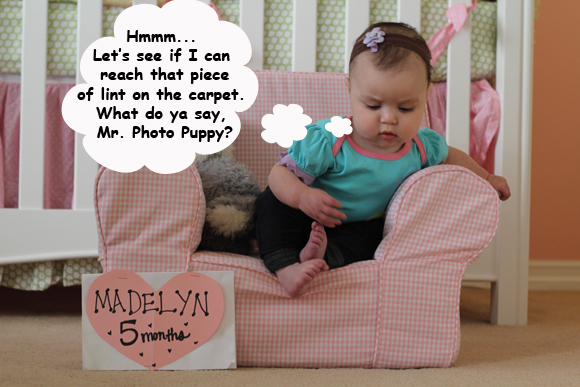 Born Friedman » Five Months! 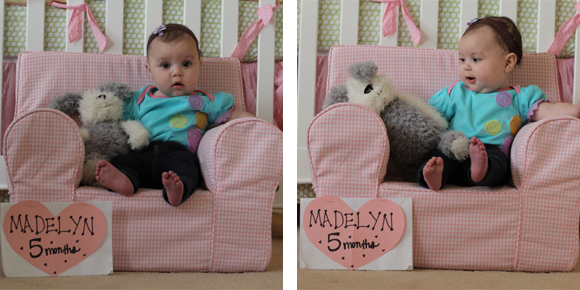 Every month, I am wowed by the growth of this super little girl. I don’t have her exact measurements and we’ll get the official stats when we go to the doctor for her six-month check up in February, but Madelyn is almost 14 pounds and probably a little more than 25 inches long. The real growth — the fun growth — is in her personality! It’s shining through now and she is so much fun to play with and watch as she explores. Started the motions to sit up. She can’t fully sit up on her own yet, but she keeps doing what looks like tummy crunches and is on the verge of getting herself up in a sitting position, but! Oohhhhh crash. I’m thinking by six months, she’ll be sitting up to do most of her playing. Gone on her first trip to the snow… even though there was no snow. We went to Tahoe in December and had a blast with our friends. She got to wear adorable clothes that bundled her up for warmth and she did a great job sleeping in a new place/mansion. Taken a great interest in her big brother, Princeton. She follows him with her eyes everywhere he goes! She’s absolutely fascinated by him. She’s also gotten curious and wanted to pet him, which is fine and dandy until her Wonder Woman Mega Grip crumples his fur into her hand and he looks at me like, “Um? Excuse me? You’re going to let her do this to me?” If he gets annoyed, he never takes it out on Madelyn. 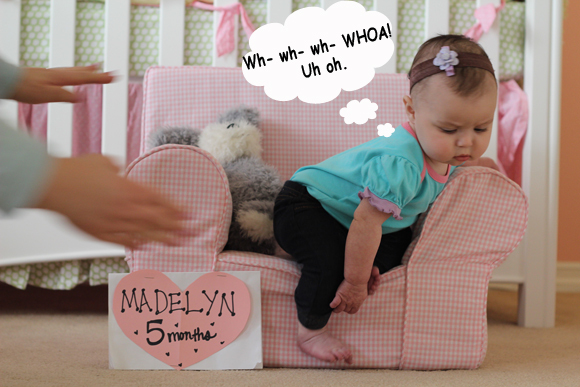 He just removes himself from the situation and Madelyn finds something else to explore. I couldn’t be happier about my kids’ relationship with each other. Tee hee! Started to teethe a little bit. There is a tiny white dot on her lower gum that gives her some trouble here and there. It’s slowed up a bit, but she was showing more signs of teething in December when her entire fist was in her mouth and the drooling was flowing like the Mississippi. So far, though, nothing has cut through so she still has that cute gummy smile. Tried solids for the first time! The doctor said to give it a whirl, and we did, but she didn’t much care either way for the oatmeal cereal. More on that later, but we haven’t continued because it may still be too soon. But it was definitely cute to feed her with a spoon and watch her discover the cereal in her mouth in confusion! Been rolling over non stop! 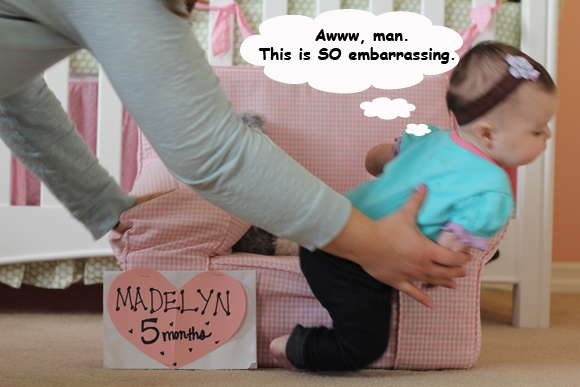 This is Madelyn’s preferred method of movement. She’s discovering new things on her playmat now that she can look at it from above. Sometimes, though, she rolls over in her sleep, wakes up, and is not happy about the position so she lets us know. Boy, does she let us know! Begun to grab for everything! Toys she used to not even care about are suddenly in her hands. She also likes to grab our food when we eat so we have to be careful when she’s on our laps at restaurants that she doesn’t get spicy sauces on her hands or get close to the water glasses. It could be disastrous. And of course whatever goes in her hands, goes in her mouth! Thank goodness for the Babyganics cleaners and wipes! Attended her first University of Arizona basketball game! This future Wildcat joined us and some of her favorite friends to watch the Cats beat the Trojans at USC. We had a great time and she was an amazing sports fan! She sat on my lap and was mesmerized by the action and movement on the court and on the big screen. Perhaps we have a future basketball star? Probably, more likely, a future cheerleader. Or, actually, if she gets her mama’s thighs, not a cheerleader. How about mascot instead?